Why do we have so much black in our closets?? Probably because we think black matches everything. But does it? There are alternatives in other neutral colors that match up with a lot of your clothes; some perhaps even better than black. It’s a myth that black matches everything. Some colors look better with brown, gray, tan or cream. 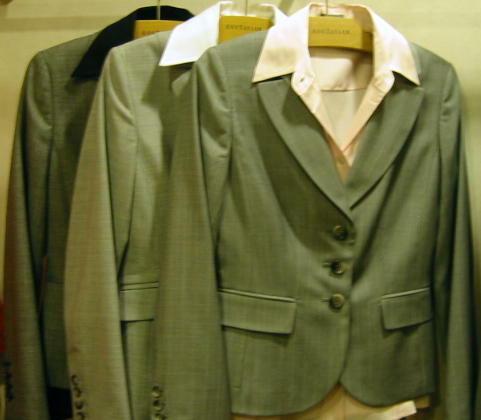 Try various shades of gray business suits, and match them up to various blouses and tops. But look carefully and take your time comparing, because all grays are not the same – some grays have faint hues of green, blue, or brown, etc. The same gray may not go with everything. Then play around with brown womens’s suits, and tan jackets – some browns are warm and some are cool. The standard black dress slacks can be added to with one pair of gray slacks and one pair of brown ones. And the standard black jacket that everybody has, can be added to with a tan blazer. These neutrals are also easy to match with a lot of things – sometimes even better than black. If you must follow a very formal and strict business attire, then darker suits are better, but they don’t all have to be black – go for dark brown suits or dark gray suits. I don’t actually recommend getting rid of all your black clothes, just don’t shop like your going to a funeral. And you might want to get better lighting in your closet, like I did – I had so much black clothes that I couldn’t see what I had!! ~ by careerfashion on March 15, 2008.